This challenge closed 25 days ago. Show us kitchens. I need to see table, chairs, a wider view. No macro of something very close. This challenge is not about a close up on food on a table. We should see something else. Winner will be displayed in Hall of Fame . 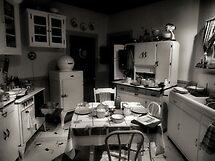 Post War Kitchen by debidabble was voted the most popular entry in this challenge with 10 votes.